Our custom personalized photo memorial bench serves as an ideal focal point in a memorial garden or special area of remembrance. The addition of a photo adds a special character to the bench. A loved ones photo is permanently fired onto a porcelain insert for a lifetime of remembrance. The decorative memorial bench is crafted in the USA of cast stone concrete, making it weatherproof and durable for all seasons. Bench and images are guaranteed to last a lifetime. A touching sentiment is engraved below the photo. A hi-resolution JPG image is required. Copyright images are not allowed. Please email the image to info@hearttoheartsympathygifts.com as an attachment and title the subject line with your last name and order number. Ships directly from manufacturer via UPS or FedEx. 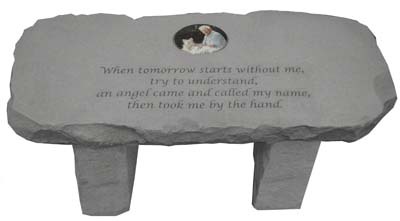 Memorial bench is an ideal gift of sympathy and remembrance.